It’s been an up-and-down season for San Antonio, but they have finally started to find their groove of late. They seemed for a while to be in danger of missing the playoffs, but they have a three-game lead on the Kings for the #8 seed. The Hawks’ record, on the other hand, won’t impress you at first glance, but based on how poor they played to begin the year, they have matured in a lot of areas. This is a talented young team who believes they can take on any opponent. They have the #18 scoring offense and #14 scoring defense, but is there no one specific area that the Spurs excel at. They don’t fancy the three ball, but they are in fact tops in the league in team 3-pt shooting %, despite taking the fewest. They don’t get to the FT line too often either, #22 in attempts, but they do rank #1 in percentage. #2 in the league in fewest turnovers committed per game as well, something else they do well. They do not dominate in any given area, but there are small things they do a great job at. DeMar DeRozan has not been taking any threes with the Spurs, rather just focusing on his game inside of the paint. LaMarcus Aldridge is still dominating other guys below the rim, something he’s been doing for years. Gregg Popovich continues to experiment with starting lineups, as the team continues to rattle off W’s. They rank as the worst defensive team in the league, but they are #14 in points scored. They had a wild 4OT shootout with the Bulls last weekend, and though they didn’t come out on top, we saw their litany of playmakers all come to play during that long showdown. They are #11 in the league in 3PT%, largely thanks to knockdown rookie shooters in Kevin Huerter and Trae Young. They have two centers (Dewayne Dedmon and Alex Len) who can also hit the three at an impressive rate, something no other team is able to say. John Collins growth has continued this year, as the second-year man is posting 20 points and 10 boards per game while shooting 38% from three. There is not a position player on Atlanta who is not comfortable with shooting the ball from beyond the arc, which is only going to serve to help them down the road. They have taken floor spacing to a whole new level. And with Trae Young on an absolute tear right now, any games they can win will give them supreme confidence going into next year. You read that right. Riding with the Hawks tonight! 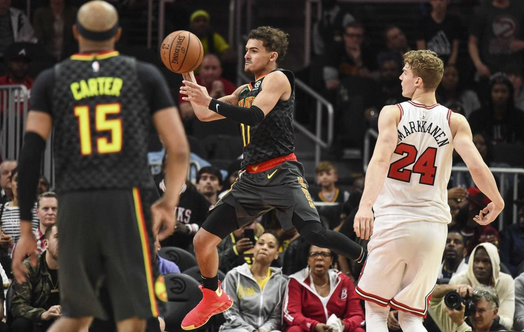 Derrick White is known for his terrific defense, but he will not be able to keep Trae Young in check, as Young’s 30-point 10-assist game will help to lead ATL to win #23 on the season!